BOMBERG is a young brand (launched in 2012), highly innovative company with deep roots in the Swiss precision watch business that is making waves for its audacious and disruptive designs. Strong and unconventional, BOMBERG reinterprets and completely overturns classic watchmaking rules to create unusual timepieces. 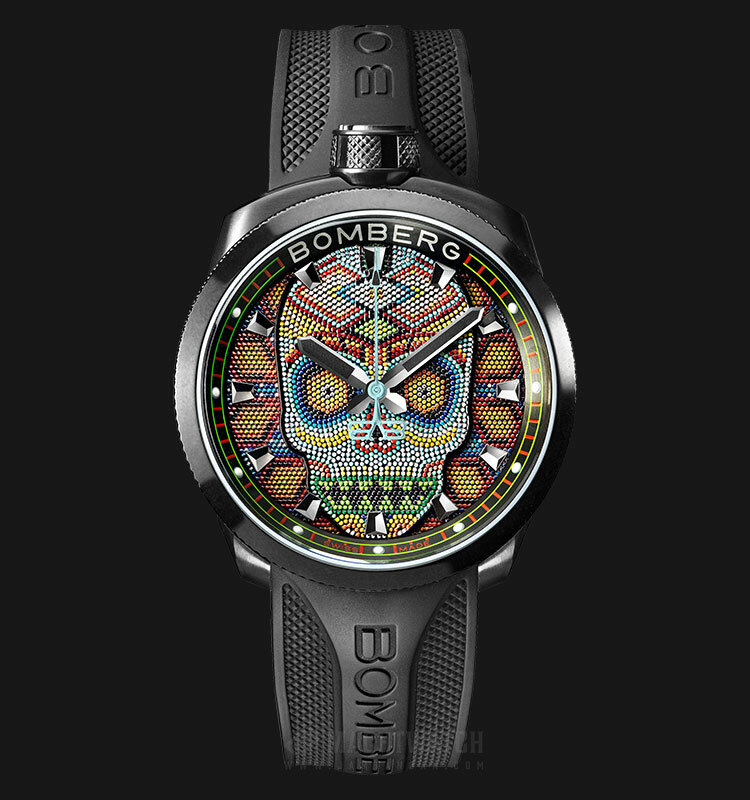 With its rebellious and provocative watches, it has infused an aging industry with new expression and has lit a fire for a type of clientele that is ready for the BOMBERG vision. In addition to world-class historical Swiss timepiece engineering – i.e., supreme mechanical performance – BOMBERG’s lines of watches and other products feature designs, colors, and functionalities ranging from the iconoclastic to the breathtaking. In breaking the rules, BOMBERG gives birth to a new nuance of excellence. Swiss design now includes potent totemic imagery, sleek industrial lines, steampunk graphics, and both vibrant and subtle colors in startling combinations. Our watches and accessories are about attitude – a can-do, hands-on, risk-taking, life-loving attitude of grabbing onto experience and excitement every day. Many of the products are exclusives, where we manufacture a limited run. You’ll find our watches go with all the good things in life. These watches are outsiders rebelling in the world of sameness, they’re timepieces that emanate the indispensable qualities of charisma, authenticity, and passion. The vision originated with company founder Rick De La Croix who sought to create something truly new in a market known for venerable histories more than cutting-edge excitement. A unique and captivating dimension to our watches is the “All-in-One” design – the same watch can be worn on your wrist, carried in your pocket on a medallion and chain, or transformed into a grenade-shaped desk clock. Our watches can be a clock and our clocks can be a watch, for wrist or pocket. We are reinventing the time-telling template. Simply put, wearing our watches makes you feel like a superstar with a true rock and roll heart. Our chronographs bring out your own inner maverick. The bold, non-conformist champion. And although wearing a watch is a personal statement, it’s also about connection as BOMBERGs are sure-fire attention-getters and conversation-starters. Even BOMBERG’s ad campaigns are provocative. With taglines such as “Toys for Boys,” “Be the Boss” and “Unchain the Beast”, “BOMBERG Warriors” its advertising uses visuals and writing to push boundaries and grab attention. Not surprising for a company with its finger on the cultural pulse, BOMBERG has partnered up with some amazing brand ambassadors and friends of the brand: the famously tattooed NBA player, Chris Andersen (the brand’s first ambassador), Nicky Jam, Claudia Gadelha, and Callum Smith, to name a a few.